NOW UPDATED FOR MISCHIEF AND MAYHEM. To install, first rename your existing file to eq2_recipe_filter_backup.vdl - this is a good practice any time you make changes. Any can easily be deleted, renamed, or modified using the standard tools in the Tradeskill window. EDIT: Version 8.2 - Newly Feathered Quills was renamed Newly Tipped Quills. Added new Perfectly Serious Items to Craft recipes for Bristlebane Day. EDIT: Version 8.1 - Added an Anchorage recipe I had missed. EDIT: Version 8.0 - Added recipes for Mischief and Mayhem, including the Anchorage missions. 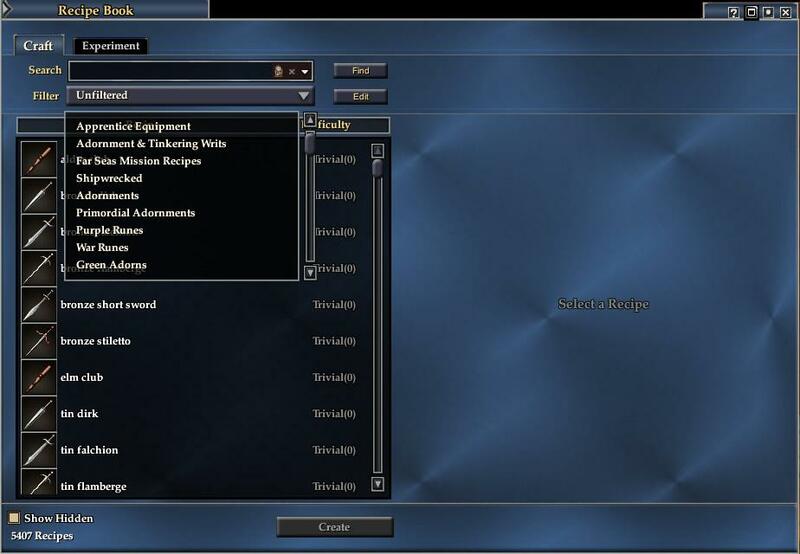 EDIT: Version 7.2 - Added recipes for Mount Gear. EDIT: Version 7.0 - Added recipes for the Chaos Descending crafting timeline; T13 recipes; and updated holiday recipes as needed. EDIT: Version 6.0 - Added recipes for PoP quests and crafting timeline; T12 recipes; new grandmaster and ancient spells, infusers, runes, adorns; Thunderous potions; items made from dropped no-trade rares; and updated holiday recipe as needed. EDIT: Version 5.0 - Added recipes from Scribbleclaw in Twark, Obulus Frontier. 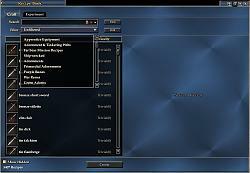 Although it's really not needed, I added a category for Kunark Ascending crafting quest recipes also. EDIT: Version 4.0 - I've added and corrected spelling on some Far Seas recipes, added the annual updates for Frostfell and Erollisi Day, and added several special categories for crafting in particular zones/levels. EDIT: Version 3.0 - I've added the recipes from Terror of Thalumbra's tradeskill quests and faction based tradeskill books. EDIT: Version 2.0 - I've added additional recipes that I'd overlooked, including more Far Seas Mission Recipes and new Holiday Recipes. Last edited by Tuirse : 01-05-2019 at 12:46 PM. Great List though! I really like it! These recipes are included (you can verify by right-clicking on the file name and selecting "edit" then searching or scrolling down). "Recipe: A Sturdy Boiled Apron"
"Recipe: A Sturdy Carbonite Knife"
"Recipe: A Sturdy Ferrite Knife"
Edit: Also just added "Recipe: A Sturdy Ash Mallet" and "Recipe: A Sturdy Lichenclover Root Basket"
"Brewday Accoutrements to Craft VIII"
"Perfectly Serious Items to Craft VI"
"Perfectly Serious Items to Craft VII"
"Perfectly Serious Items to Craft VIII"
"Romantic Gifts to Craft IX"
"Romantic Gifts to Craft X"
"Frostfell Feasts and Decorative Crafts IX"
"Frostfell Outfits You Can Make IX"
"Scholarly Pursuits for a Festive Frostfell IX"
Added to "Holiday: Nights of the Dead"
"Celebrations of the Dead IX"
Last edited by Rosyposy : 11-06-2017 at 07:27 PM. Apparently the last upload didn't get the newest version. I have corrected this, and the download now definitely has the version with Kunark Ascending stuff in it! Thanks for updating this. My list was lo9okng pretty bad too so this it terrific! Here's the thing tho: I can't edit the file and have the changes show in game. I used to always be able to change and add the various new items with no issues. Now, it's just not seeing them. I am baffled as to what could be happening, except that the file is now being read from some other location. Very frustrating. Any ideas on what I might try? EDIT: Actually, the news is much worse. I have no other copy of this file on my computer, however the new one keeps being overwritten by an old one I had. I have deleted it before adding yours, etc. but it is still there when I log out. Any idea how this could happen? Is the file somewhere else in the game memory? This is Windows 10, the most recent update. Last edited by Suziekew : 05-29-2017 at 01:45 PM. I just downloaded this and it seems to still have the old file because none of the new recipes are in the download.